Last year, Jim Carrey won the 2010 Kids' Choice Awards for 'Favorite Voice from an Animated Movie' for "Disney�s A Christmas Carol". While he wasn�t present at last year�s awards, Jim did make a surprise appearance during the climax at this year�s Nickelodeon's 24th Annual Kids' Choice Awards with host Jack Black. Jim descends from a hot air balloon before dumping some slime onto the crowd from some heavy balance bags. When asked by Jack about his appearance, Jim said that he was here to accept the award for "Favorite Actor of All-Time in the Universe." Instead of that award, Jack unleashed some slime from the balloon on Jim. 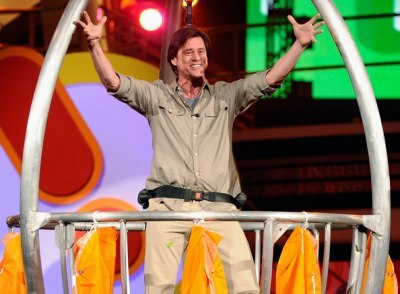 In a repeat from his 2003 appearance, Jim once again plays Bruce Almighty by unleashing more slime on both the host and the crowd. Don�t forget to catch that moment during the Kids Choice Awards when it repeats on Nickelodeon during this week. Also, check out Jim and Jack (in one of his early roles) in the 15th Anniversary Blu-Ray edition of the Ben Stiller-directed "The Cable Guy". You can check many pictures from the show, click here. And check the video clip below.